Teramo is in Teramo province, Abruzzi region. There is another variation at <www.inyourlife.com>. An interesting article (in Italian) on the history of Teramo's flag is at <www.delfico.it>. The article, by Francesco Savini, is from 1933. The article concentrate, first, on the four ward flags visible behind the municipal arms, also appear on the variation above. 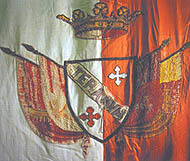 The picture at Savini's article show flag or gonfanon apparently divided vertically white and red, this division also appearing in the shield which should in fact be completely red (gules). The colours of the ward flags behind the shield have seriously aged or they may have not been very accurate in the first place. As to the earlier town flag(s) used, Savini mentions various appearances in the 14th and 15th centuries but has to admit its shape and colour(s) are uncertain. If I understand him correctly, he and other scholars come to the conclusion that it must have been red and white, divided vertically, the red nearest the staff. Old sources mention the use of district or ward banners but these are unknown although medieval heraldic consciousness must have shaped them. The local festival of St Anne was an occasion for display from about 1550 to the eighteenth century; in those days, there were six wards. The colours used appeared in the festival uniforms, or vice versa; the festival ended with a display of flags. Savini pieces together scanty information from various sources, one of which is a description found in the municipal archives and has been edited, in the sense of applying the laws of heraldry, by him  in other words, reasoned conjectures. Ward of St George: vertically divided red and white (red next to the staff). Red winged dragon, standing and facing the hoist  details of the design are lacking but red (gules; colour) is supposed to have been placed on white (silver; metal). Also, red was used by the Romans. Ward of Our Lady: vertically divided black and red (black next to the staff), originally an elephant bearing a tower on a black field (here facing the hoist); now it appears as white on red as it alludes to one of the titles of Our Lady (Tower of Ivory) and is heraldically proper. Ward of St Leonard: red, bearing a yellow seven-oared galley with the prow facing the fly. Here again, yellow (gold; metal) is chosen for heraldic reasons to appear on red (gules; colour). Ward of the Holy Ghost: vertically divided yellow, white and green (yellow next to the staff), a rectangular (sic) tower in the centre. Green, the outermost colour in the flag, has been chosen because the other colour yellow (gold) must not be used on the white (silver) section. The tower is thrice embattled and has an open gate and two windows. More information about the town symbols at <www.turiteramo.it>.